There's No Place Like Home: Thank You and A Parade! Thanks to all of you who left comments about our exciting news! It makes me feel warm and fuzzy, and grateful that you would take time to pray for our baby and wish us good things! We went to the doctor today and the baby looked great! I am just 11 weeks, the baby is the size of a kidney bean, but we saw arms and legs, a round belly and and a cute profile. Most importantly, a strong heartbeat! It's crazy that all that fits on a kidney bean! Katie's going to be a great big sister! She thinks the baby is in my belly button right now. She keeps saying, "let me see it!" This picture is from Friday when we went to the State Fair parade in Dallas with Marcus's sister and our niece. Katie's grabbing herself, because she just fell and got scraped. The inappropriate picture is making the blog anyway, because I rarely get a picture of the 3 of us! Sorry Katie. When you have a blog you can put silly pics of me on there! We got cotton candy at the parade! I feel like one of the best parts was the wheeling Elvi...and the cotton candy. We really went there to see the DBU Patriettes! My niece, Jennifer is in that group. She's the one looking our direction. And I had to include this float with all the yummy fair food on it! That's one of the highlights! We are hoping to go to the fair next week! Due to being "with child" I can't ride anything. I am kind of glad about that, because Marcus always talks me into a roller coaster that scares me to death. Now I have a good excuse to decline! 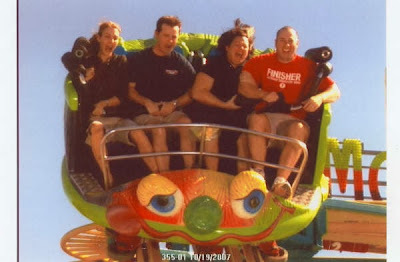 Courtney, Stephen, Me and Marcus on the Crazy Mouse. That was so fun, and the picture was totally worth it, but I don't want to do it again! HOOORAY for you baby news! It's been so fun following your blog from all the way in CO for a few years now...I hadn't peeked in in awhile and thought "wonder if there's some fun news!" and bam! There was! Praying for you and that bean! Thanks for sharing! P.S. are you going to have your shopping afternoon this year? Would love to put it on the calendar if you are since I work Saturdays!